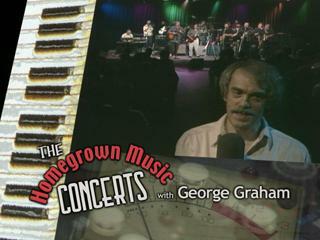 After over more than a quarter-century on Public Radio, the Homegrown Music series has become a regular feature of Public television (WVIA-TV/44) in a weekly series, videotaped a monthly live radio concerts on WVIA-FM. No fancy or pretentious music video effects, just great performances captured live as broadcast on the radio. The Homegrown Music TV series is currently on hiatus on WVIA-TV, but episodes from series 11 and 12 are available on demand. Produced by George Graham, Video direction by Richard Briggs, Gerry Coleman (series 1), Jim Frushon, Jim Langan, and Kim Herron, Chris Sheerer, and Kathryn Davies (series 7), Greg Brown (series 8). Audio by Bret Alexander (series 8 and 9), Rob Knecht, Roberta Steadele, Julia Knaus (series 2 and 3), Debbie Makara (series 1) and the late Bruce Stedron (series 1 and 2). In High Definition, with some programs in Dolby Suround. #1001: Simon Apple. A first rate, musically sophisticated rock band from the Philadelphia area, the group called Simon Apple performs their creative original music, marked by first-rate musicianship and creative arrangements. (Recorded 5/14/2007) In 5.1 surround sound. #1003: B.D. Lenz. Jazz-rock fusion guitarist (and high-school math teacher) B.D. Lenz performs his first-rate original music with his band in a return to Homegrown Music..(Recorded 11/12/2007) In 5.1 surround sound. #1005: The Five Percent. Outstanding original rock from a popular Scranton/Wilkes-Barre area band. (Recorded 2/11/2008) In 5.1 surround sound. #1006: Invert. Not your typical classical string quartet, Invert transforms their string instruments (with two cellos) into something entirely new with their original compositions and group improvisations. (Recorded 5/19/2008) In 5.1 surround sound. #1007: Bob Malone. Pianist extraordinaire and witty singer-songwriter Bob Malone returns to Homegrown Music this time with a band to put in an energetic performances of his original songs. (Recorded 4/14/2008) In 5.1 surround sound. #1008: Julia Joseph. Singer-songwriter Julia Joseph performs her breezy original music with an eclectic backing band. (Recorded 4/14/2008) In 5.1 surround sound. #902: Eric Mintel Quartet. Southeast PA jazz pianist gets together with Poconos jazz musicians, including saxophonist Nelson Hill to perform original tunes and creative arrangements of jazz and rock standards. #911: Jonah Gregory and Hannah Bingman. Jonah is a young bluesman from the Williamsport area who won the 2006 Billtown Blues Challenge. He performs a collection of traditional and original blues in an acoustic setting. Andy Goessling: flute, banjo, guitar, etc. with: Mark Covell: bass; Michael Fossa: piano on "Yellow"
#105: Neal Casal. Acclaimed singer-songwriter in two different settings, solo (recorded 3/25/1997) and with a band (recorded 4/14/1998).